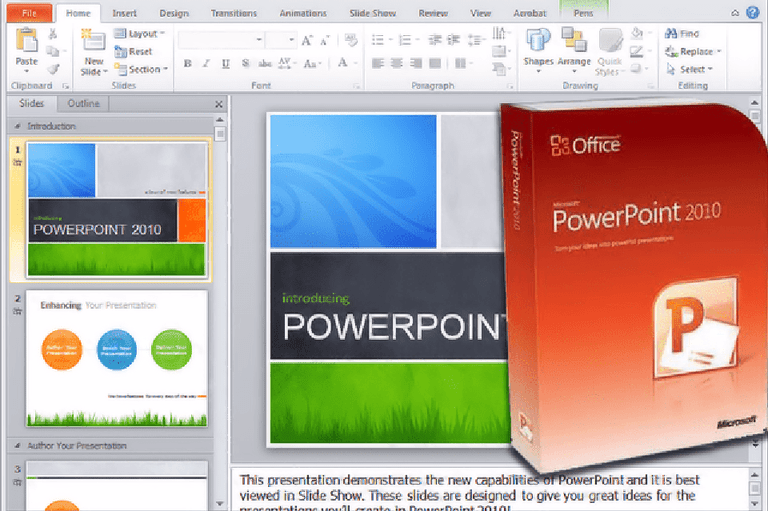 What's New in Microsoft PowerPoint 2010? Microsoft PowerPoint 2010 — part of the Microsoft Office 2010 suite — was released to market in the middle of 2010. It was superseded by Office 2013, Office 2016, and (in the second half of 2018) Office 2019. Older versions of Microsoft Office are more susceptible to security vulnerabilities and they cannot support several advanced features in the Office 365 platform. Microsoft stopped supporting Office 2010 with Service Pack 1 in October 2014, although enterprise users on Service Pack 2 enjoy extended support through October 2020. Upgrade to a more modern version of Microsoft Office to obtain current advanced features and protection against malware. We retain this article primarily for its historical value, and because some people with very old machines (or people in companies or schools with slow upgrade cycles) still use PowerPoint 2010 despite its obsolescence. For those of you who got on board with PowerPoint 2007, this screen will look familiar. However, there are some new additions to PowerPoint 2010 in terms of features, and some subtle additions in terms of slight changes to existing features in PowerPoint 2007. File Tab: The new File tab in the left corner of the ribbon replaces the Office button. Many of the same features are present and some new features have been added. Ribbon: The ribbon replaces the toolbar in older versions of PowerPoint, prior to PowerPoint 2007. Quick Access Toolbar: This toolbar appears in the top left corner of the PowerPoint 2010 screen. This is a customizable toolbar, so that you may add icons for features that you use frequently. Tabs on the Ribbon: These tabs on the ribbon are headings for groups of tasks. These tabs look similar to the headings on the menus in older versions of PowerPoint. Help Button: This tiny question mark icon is how to access help for PowerPoint 2010. Slides/Outline Pane: The Slides/Outline pane is located on the left side of the window. The Slides pane shows thumbnail versions of each of the slides in the presentation. The Outline pane shows a text outline of all the information on the slides. Notes: The Notes section is a place for the speaker to jot down any hints or references for his presentation. Only the presenter will see these notes. Status Bar: The Status bar shows current aspects of the presentation, such as the current slide number and what design theme was used. A tiny Common tools toolbar gives quick access to features that the presenter would use often. When you click the File tab of the ribbon, you are presented with what Microsoft is calling the Backstage view. The is the place to look for any information about this file, such as the author, and options for saving, printing, ​and viewing detailed option settings. That old saying "What's old is new again" comes to mind. Microsoft Office users were used to the File option on the old menu, and the new ribbon was different enough. So, the return of the File tab on the ribbon will be comforting to many users, especially those who didn't jump on the Office 2007 bandwagon. Slide transitions have always been a part of PowerPoint. However, the Transitions tab is new to the PowerPoint 2010 ribbon. The Animation Painter is one of those "Now why didn't we think of this before?" kind of tools. Microsoft has created a tool that works similarly to the Format Painter. The Animation Painter will copy all the animation features of an object to another object, another slide, multiple slides, or to another presentation. This feature is a real time-saver as you do not have to add all these animation properties separately to each object. The added bonus is many fewer mouse clicks. PowerPoint 2010 now helps you share your presentation over the internet to anyone in the world. 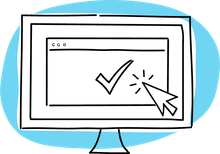 By sending a link to the URL of your presentation, your global audience can follow along in their browser of choice. The viewers do not even need to have PowerPoint installed on their computer. This is a small feature, but many users of PowerPoint find that they like to see more of the presentation on the screen and they want to reclaim some of that valuable real estate. In PowerPoint 2007, you could hide the ribbon, so the feature has always been there. With this version, Microsoft has just introduced a tiny button to do it with fewer clicks of the mouse. PowerPoint 2010 now offers the option to embed or link to a video (which is currently located on your computer) into your presentation or to link to a video on a website, such as YouTube. Embedding a video located on your computer saves a lot of anguish if you later move or send your presentation to another location. Embedding the video means that it always stays with the presentation, so you don't have to remember to also send the video file along. The video can be of an actual "movie" type or you can also embed an animated GIF type of clip art. On your computer greatly reduces the file size of the overall presentation. However, you risk forgetting to copy the video file when you move the presentation to another location. On a website such as YouTube, allows you to embed the code of the video into your presentation. The video is not really in your presentation, so you will always need an internet connection in order to view the video. Microsoft has realized the value of converting a presentation into a video. Users of PowerPoint have been asking for this for years, and at long last, the feature is present in PowerPoint 2010. The WMV video file format can be read by most computers. You can still use other software to convert the presentation into other file formats (such as AVI or MOV for example) if you choose. Any transitions, animations, sounds, and narration will be embedded into the video. The video can be published to a website or emailed. It is not editable, so the entire presentation will always remain as the author intended. You can control the file size of the video by selecting appropriate options. The targeted audience does not need to have PowerPoint installed on their computer in order to view the video.